Hope you have liked these posts! Unity interception enables you to effectively capture calls to objects and add additional functionality to the target object. Interception is useful when you want to modify the behavior for individual objects but not the entire class, very much as you would do when using the Decorator pattern. It provides a flexible approach for adding new behaviors to an object at run time. Lets create a Calculator which provide implementation for adding 2 numbers. //     pipelines that they're included in. //     Implement this method to execute your handler processing. //     Inputs to the current call to the target. //     Delegate to execute to get the next delegate in the handler chain. //     Return value from the target. //     handler as specified in the attribute configuration. //     A new call handler object. The above code create unity Container, then a extension for interception is added, then type is registered, resolved to get a instance of calculator. Then in Test Case 1, AddMe method is called with input 3,4. This call is intercepted via InterceptorAttribute and Pre-processing before the call [Input parameters are printed to Console] and Post-processing after the call is done [Result parameters are printed to Console]. Anything can be done in these locations. This is decorator pattern. 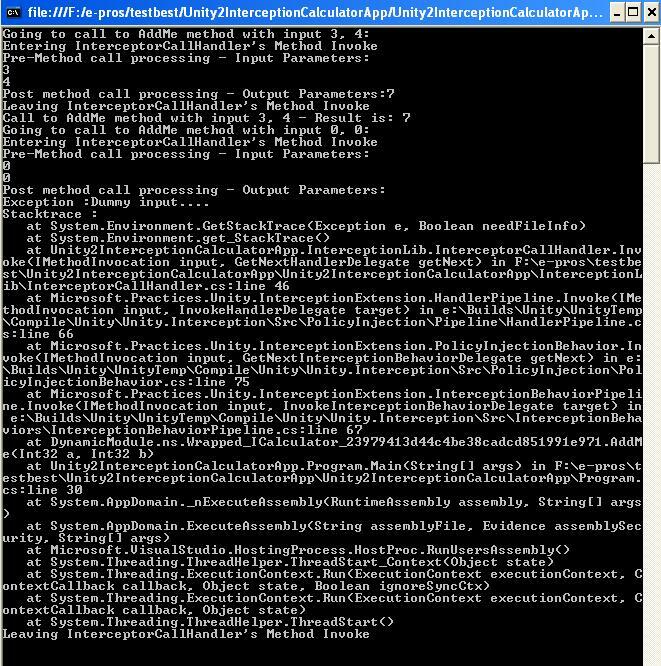 Then in Test Case 2, AddMe method is called with input 0,0, this call is again intercepted via InterceptorAttribute and Preprocessing before the call [Input parameters are printed to Console]and Post-Processing after the call is done[Exception is handled and Call stack is printed on Console.] This is again decorator pattern implementation. Download complete source code here. So that is how interception works in Unity Container. For automatic constructor injection, simply specify as parameters of the constructor the dependent object types and specify the concrete type, or specify an interface or base class for which the Unity container contains a registered mapping. In this code above we defined a constructor in the BusinessManager class that takes as a parameter the concrete type of the dependent class, and apply a Dependency attribute to the parameter that specifies the name of the registered mapping to use. When a target class contains more than one constructor with the same number of parameters, you must apply the InjectionConstructor attribute to the constructor that the Unity container will use to indicate which constructor the container should use. As with automatic constructor injection, you can specify the constructor parameters as a concrete type, or you can specify an interface or base class for which the Unity container contains a registered mapping. When a target class contains more than one constructor, Unity will use the one that has the InjectionConstructor attribute applied. If there is more than one constructor, and none carries the InjectionConstructor attribute, Unity will use the constructor with the most parameters. If there is more than one constructor that is the “longest” with the same number of parameters, Unity will raise an exception. Similarly, Property (Setter) Injection and Method Call Injection can be peformed as common form of Dependency Injection. In Step 1, a instance is registered,then resolved and method is called. UnityContainerExtensions static class has extension method for UnityContainer which registers a default instance mapping with the container so that it returns the specified instance when a Resolve method requests an instance of the type TInterface (which can be an implemented interface instead of the actual type). The container takes over the lifetime of the instance. //     Register an instance with the container. //     called on (this in C#, Me in Visual Basic). //     the lifetime of the instance. In step 2, a named intance is created and named resolve is called. UnityContainerExtensions static class has extension method for UnityContainer which registers a named instance mapping with the container so that it returns the specified instance when a Resolve method requests an instance of the type TInterface (which can be an implemented interface instead of the actual type) and the specified name. The container takes over the lifetime of the instance. Names are case sensitive. //     This overload automatically has the container take ownership of the instance. In step 3, a named intance is created and named resolve is called with container life manager specified. UnityContainerExtensions static class has extension method for UnityContainer which registers a named instance mapping with the container so that it returns the specified instance when a Resolve method requests an instance of the type TInterface (which can be an implemented interface instead of the actual type) and the specified name. Names are case sensitive. Also registers the specified LifetimeManager instance with the container to manage the lifetime of the returned object. //     will be managed by the container. In Step 2, of above sample, Unity provides a ResolveAll method which return all the Types, then there is a loop to call write mehtod of all the resolved types. My Team scrum Master – Akhtar pointed out that Unity is good container for Dependency Injection in .Net plate form, so I decided to explore it a little bit. Unity is a lightweight, extensible dependency injection container that supports interception, constructor injection, property injection, and method call injection. You can use Unity in a variety of different ways to help decouple the components of your applications, to maximize coherence in components, and to simplify design, implementation, testing, and administration of these applications. Unity is a general-purpose container for use in any type of Microsoft® .NET Framework-based application. It provides all of the features commonly found in dependency injection mechanisms, including methods to register type mappings and object instances, resolve objects, manage object lifetimes, and inject dependent objects into the parameters of constructors and methods and as the value of properties of objects it resolves. 1. UnityContainer: A simple class which provides extensible dependency injection container. //     Register a type mapping with the container. //     System.Type that will be requested. //     System.Type that will actually be returned. //     This overload registers a default mapping and transient lifetime. //     Resolve an instance of the default requested type from the container. //     Container to resolve from. //     Any overrides for the resolve call. //     System.Type of object to get from the container. Note here that a each time Resolve is called, constructor is callled- means new instance of object is created. This is because by default TransientLifetimeManager is used for life time management6 of objects. In abvoe code ContainerControlledLifetimeManager is used as life time manager for objects which effectively implements a singleton behavior for objects. So for 3 Resolve call, only single object is created-one call to constrcutor is given. Hope this simple code explains the basics of Unity as Dependency Injection container. You are currently browsing the archives for the Unity 2.0 category.